Roger Rabbit, Mickey Mouse buddy movie in development from writer Gary K. Wolf based on "The Stooge"
Gary K. Wolf is best known for writing the novel that inspired the wildly popular 1988 film “Who Framed Roger Rabbit?”. 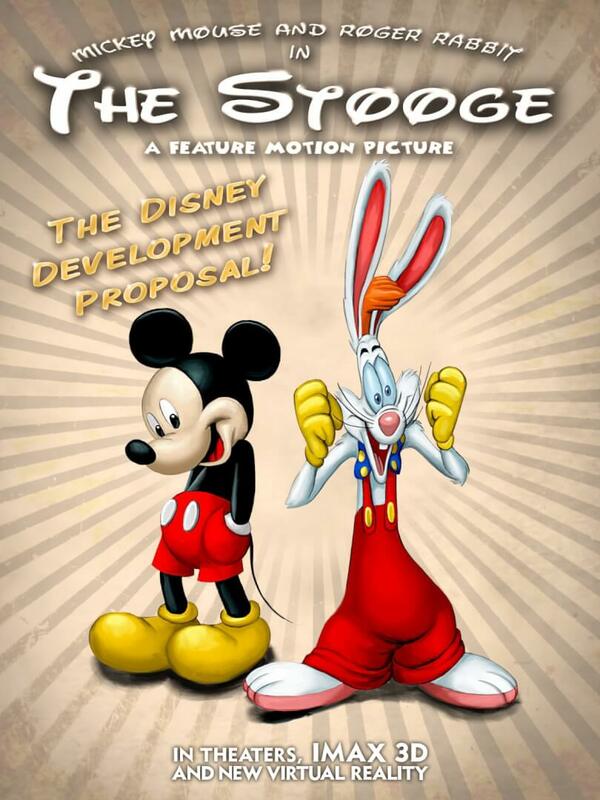 Under Toontown reporter pen name Walter Windchill, Wolf has announced on his blog that he is now developing a concept to start Roger Rabbit in a new feature film called “The Stooge” alongside Mickey Mouse. I’ve just been told by one of my hush-hush Hollywood sources that there’s a new movie in the works starring big-time Toontown stars Mickey Mouse and Roger Rabbit. The movie is called The Stooge. It will be based on the classic Dean Martin and Jerry Lewis movie of the same name. The story has the emotional empathy and sensibilities of Wall-E and Toy Story. It will be a (G) Rated Pixar type animated musical buddy comedy. Mickey takes on the Dean Martin role, Roger, who is already regarded as a comic genius in France, takes the Jerry Lewis part. The film incorporates five specific locations from the Disneyland park. It also introduces the Toon Train, an exciting and interesting way to travel through Toontown. The film features real-life people. Walt Disney costars. Orson Wells makes an appearance. The packaged Development Proposal is currently being evaluated by Disney and Pixar. Meetings are happening! Directors and writers are being evaluated. Whether Wolf is actually developing such a film or just hoping to grab some headlines is unknown, but he is writing a new Roger Rabbit novel called “Who Wacked Roger Rabbit?” to be published by Musa some time this year, so the latter is certainly a possibility, especially with the out-there notion of Walt Disney and Orson Wells appearing in the film. For several years, director Robert Zemeckis has hinted at the possibility of another Roger Rabbit film, though most of that talk was happening while he was deep in the motion capture business with Disney. With that studio shuttered, there’s been little talk as of late. Fans continuing to clamor for more Roger Rabbit, will at least be able to enjoy the original and a few extras as “Who Framed Roger Rabbit?” makes its Blu-ray debut on March 12. Tagged:Gary K. WolfMickey MouseRoger RabbitThe StoogeWho Framed Roger Rabbit? With the mentioning of Walt Disney and Orson Welles, I hope he means that the two will be played by actors, since the real Walt and Orson are no longer alive. C’mon c’mon, I want this to be Disney’s first hand drawn film since Winnie the Pooh. Older Older post: VIDEO: Monsters Inc 3D Blu-ray review, Monsters University at Toy Fair 2013 with John Goodman, director, and toy demos.